Now that I had decided to build a mountain bike, I needed to turn one again to My Cousin - who I will abbreviate here as M.C. - for help. He had built bikes before and I knew he had the uncanny ability to seek out the best of the best while also pursuing the least expensive options. It was the latter ability which interested me the most: I had some money to spend on this project but I couldn't go overboard. I thought long and hard on what I could do to make the project cheaper: I have multiple bikes, but I figured that since I can only ride one at a time, the Untitled Mountain Bike Project could share some components with the Dahon. The 26" wheels were the first thing I thought of. The seatpost was the second. As I posted before, the Cane Creek Thudbuster is a great seatpost; new it costs over $130 but if you look hard enough on eBay you might find one for under $100 (as I did). It sounds like a lot, but when you ride over your first bump with it, you will know where that extra money went. The seatpost I bought that fits on the Dahon is 27.2 mm wide; so I'd just have to find a MTB frame that had the same sized opening. How hard could that be? Good to hear you are going to build one. Also available as a full bike built very decent for $999. http://www.pricepoint.com/detail/18722-018_SETAC8-277-Bikes--/Sette-Ace-Bike-W_Rock-Shox-Monarch-2.1.htm. For a shock I would do something from Rock Shox with an air spring. Like this Tora Solo Air: http://cgi.ebay.com/Rock-Shox-Tora-SL-Solo-Air-120mm-Black-PopLoc-Remote-/330453520386?pt=Cycling_Parts_Accessories#ht_8874wt_920. It'll run around $225. Alternately if you want my Rock Shox Reba Race (few steps up) for $250 I'd use it as an excuse to upgrade to a Reba Team. Hard to beat that full bike price for the Sette Ace though... We could build a bit cheaper with the carbon frame or by compromising on some parts, but on that bike they made the right choices. All sounds cool...I'm toying with the idea of buying your used fork since I trust your judgment. The complete bike is nice but you make building a bike sound fun (and remember I have good rims, tires, seatpost/seat and disc brakes to get started)Wonder about cost/benefit analysis of aluminum hardtail frame vs. carbon (durability vs. cost vs. weight, etc) I've only had steel or aluminum frames and have never ridden on carbon. Thoughts? Aluminum will be cheaper, almost as light, but much less comfortable. Carbon eats up the bumps nicely. It would only save you around $100-150 to go with an aluminum hardtail. I think for that amount it’s worth going with the carbon. After looking at the links M.C. sent, I thought for a while. I really wanted to splurge on the carbon frame, but I didn't want to run out of money. I knew a hardtail frame would ride stiffer, Thudbuster or no Thudbuster, but I've never owned a full suspension bike and wouldn't 'miss' something I had never tried (For instance, I sometimes have passengers in my Honda Element complain about the rough ride, but I laugh and tell them that the car I had owned previously was a bone-rattling Jeep Wrangler and the Element was like a Bentley Brooklands to me). I hunted the web for more options and found one: a $199 frame on sale for 50% off, and with Nashbar's semi-regular 20%-off-any-purchase coupon and the shipping, meant I'd have a frame for just $97. I send M.C. another email telling him my exciting news. I decided to go with aluminum for this project and will build a carbon fiber one later if I find myself using it more than six times a year. If I was still in NH or lived near where you do (a place with quality mountain bike riding five minutes from my house) I'd fork over the extra money, but not this time. 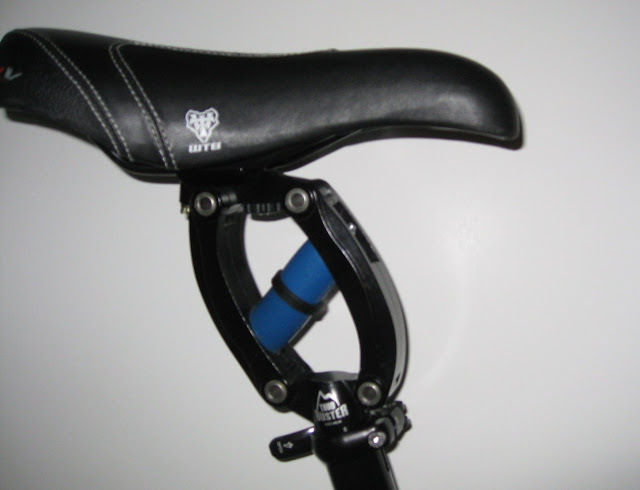 Besides, I've always used aluminum frames and have been indifferent to the stiffness (especially now with the Thudbuster seatpost I have). I found a new no-name frame for $97 including shipping: 120mm head tube length, takes a 68 mm bottom bracket, 1 1/8" front fork and a 31.8 derailler clamp. This kind of savings made me think it might be worth going bigger and better on other components that can last if I later upgrade to carbon fiber. That said, would your Reba Race fit on the frame I have? That should work well, have a link to the one you bought? The fork I have would fit that no problem. When does the frame arrive? should arrive in a day or two. I have a full set of mechanical disc brakes I can use for it, the wheels and seatpost of course but everything else I'll have to hunt for. Sram X.9 Rear Derailleur - $40. EA30 riser handlebar - $20. Specialized carbon flat handlebar - $5. Specialized stem – 120 mm - $5. For a crankset and bottom bracket this can’t be beat: http://www.jensonusa.com/store/product/CR303A00-Shimano+Lx+Fc-M582+Crankset.aspx?sc=FRGL. Here’s a great headset for a great price: http://www.jensonusa.com/store/product/HS507A01-Cane+Creek+S-3+Headset.aspx. Front derailleur – make sure to get 31.8. I think your frame is top-pull but this does either: http://www.jensonusa.com/store/product/FD311A01-Sram+X7+Front+Derailleur.aspx. Thanks, you are The Man. We'll have to get together soon so I can have a look at all these; let's talk to our wives and try to figure out a dinner next week at either house or someplace in the middle. Sounds good, we are away until next Thursday though (San Francisco). Send me an email or call when you get back; we''ll do something then for sure since I'll want to start building. so you can ride across the Golden Gate bridge if you haven't already; I did that in '07; I went across the bridge and went righton Alexander Avenue and took a left on Bunker Hill and rode through a really long, trippy tunnel. I was very thankful for M.C. 's guidance. Now that I had a list of things to buy, there was little left for me to do but move onto the next step: start buying.